"Bye everyone. I have nothing, I have nothing. July, I love you. Never forget that. I leave with a smile how happy you made me while it lasted. To my family, I ask forgiveness. The wants, Gabi, "wrote the woman, originally from Veracruz, before committing suicide. 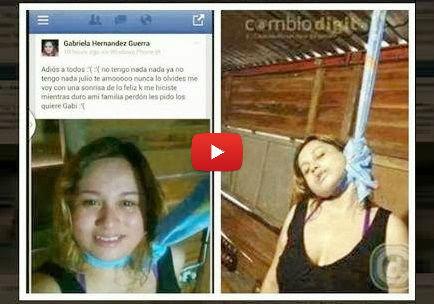 Mexico does not leave his shock over the suicide of a young woman who announced his intention in your social network profile. It was deactivated after the image reap more than 20,000 “Likes” and will increase the number of followers in similar amounts. The images run through the web and also the words that he said goodbye to her family and her ex boyfriend, Julio.